An entirely unique Disney experience just to the west of Disney's Animal Kingdom® Theme Park. It's the thrill of staying at a wildlife reserve with animals grazing just beyond your balcony. Rejuvenate both body and spirit in luxurious surroundings while sharing the grandeur of the African wilderness. The beauty of the savannah, the rhythm of tribal drums, exquisite cuisine in lush settings and the lure of authentic African treasures all come together to celebrate the beauty and wonder of this vast and untamed continent. Supervised activities including toys by Hasbro, free play arcade games (2), arts and crafts, games, Disney movies, and Sony Playstations. (Ages 3-12; advance reservations highly recommended; credit card guarantee is required.). 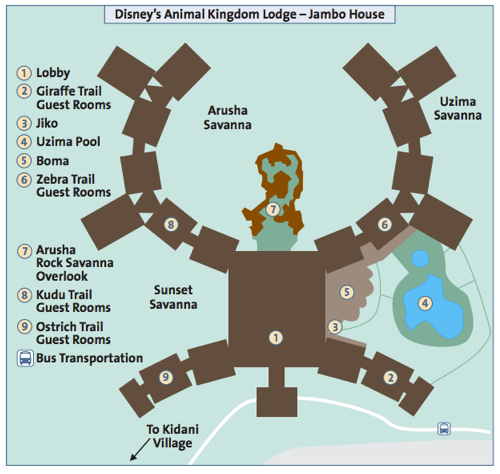 Simba's Cubhouse provides a complimentary dinner for children in the Cubhouse. Guests can order meals for their children when they check in. Menu items include: peanut butter and jelly sandwich, chicken fingers, mini burger, hotdog, macaroni and cheese. No outside food, please.